Frank Alexander was born perhaps about 1850. Harrison Colby, A genealogy of the descendants of Abraham Colby and Elizabeth Blaisdell, his wife, who settled in Bow in 1768, , at https://archive.org/details/genealogyofdesce00colb . Concord, N.H.: Printed by the Republican Press Association, (1895) Microfilm #896944 of the Family History Library, Salt Lake City, Utah, pp. 67-8. James Alexander was born perhaps about 1848. Harrison Colby, A genealogy of the descendants of Abraham Colby and Elizabeth Blaisdell, his wife, who settled in Bow in 1768, , at https://archive.org/details/genealogyofdesce00colb . Concord, N.H.: Printed by the Republican Press Association, (1895) Microfilm #896944 of the Family History Library, Salt Lake City, Utah, p. 63. 1880 United States. Bureau of the Census. 10th census, California, 1880 federal census : soundex and population schedules, Washington: The National Archives, ([19--?]) , FHL Film 1254081 National Archives Film T9-0081 Page 237A. "United States Census, 1900," database with images, FamilySearch (https://familysearch.org/ark:/61903/1:1:M9G1-F6T : accessed 10 December 2016), James R Alexander, Precinct 13 San Francisco city Ward 35, San Francisco, California, United States; citing enumeration district (ED) 119, sheet 13B, family 287, NARA microfilm publication T623 (Washington, D.C.: National Archives and Records Administration, 1972. ); FHL microfilm 1,240,103. "New Hampshire Births and Christenings, 1714-1904," database, FamilySearch (https://familysearch.org/ark:/61903/1:1:FDJ5-1VT : 12 December 2014), James Green Allexander, 12 Feb 1815; citing BOW,MERRIMACK,NEW HAMPSHIRE; FHL microfilm 0015553 IT 14. Bow (New Hampshire). Town Clerk, Bow, New Hampshire town records, 1757-1977 and births, marriages, and deaths,1826-1915, Salt Lake City, Utah: Filmed by the Genealogical Society of Utah, (2001) , Batch number: C502651, Source Call No. 0015553 IT 14. 1880 United States. Census Office. 10th census, 1880 federal population census, Washington, District of Columbia: National Archives and Records Service, ([19--]) , FHL Film 1254766; National Archives Film T9-0766; Page 209D. 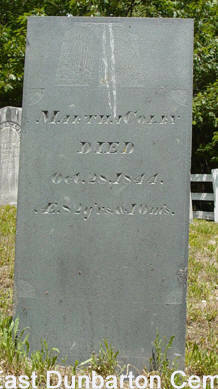 Martha married Jonathan Colby, son of Abraham Colby and Elizabeth Blaisdell. Ezra Scollay Stearns and M T Runnels, History of Plymouth, New Hampshire, Cambridge, Mass. : University Press, (1906) , Vol. 2, p. 72. Harrison Colby, A genealogy of the descendants of Abraham Colby and Elizabeth Blaisdell, his wife, who settled in Bow in 1768, , at https://archive.org/details/genealogyofdesce00colb . Concord, N.H.: Printed by the Republican Press Association, (1895) Microfilm #896944 of the Family History Library, Salt Lake City, Utah, p. 65, #228. Massachusetts Vital Records, 1841-1910, , Vol: 329 ; Page: 8. Harrison Colby, A genealogy of the descendants of Abraham Colby and Elizabeth Blaisdell, his wife, who settled in Bow in 1768, , at https://archive.org/details/genealogyofdesce00colb . Concord, N.H.: Printed by the Republican Press Association, (1895) Microfilm #896944 of the Family History Library, Salt Lake City, Utah, p. 64. Vital records of Bridgewater, Massachusetts, to the year 1850, Boston, Massachusetts: New England Historic Genealogical Society, (1916) , Vol. 1, p. 26. Asa W. Allen, Genealogy of the Allen and Witter Families, , at https://books.google.com/books?id=FWBAAAAAYAAJ . Salem, O.: Luther W. Smith, (1872) , p. 102. "Massachusetts Births and Christenings, 1639-1915," database, FamilySearch (https://familysearch.org/ark:/61903/1:1:V5FP-ZMS : 4 December 2014), Abigail Allen, 12 Oct 1744; citing BRIDGEWATER,PLYMOUTH,MASSACHUSETTS, ; FHL microfilm 164,691, 164,692. Vital records of Bridgewater, Massachusetts, to the year 1850, Boston, Massachusetts: New England Historic Genealogical Society, (1916) , Vol 1, p. 26. Vital records of Bridgewater, Massachusetts, to the year 1850, Boston, Massachusetts: New England Historic Genealogical Society, (1916) , Vol. 1, p. 27. Nahum Mitchel, History of the Early Settlement of Bridgewater in Plymouth County, Massachusetts, , at https://books.google.com/books?id=KIc-AAAAYAAJ . Bridgewater, Massachusetts: Henry T. Pratt, (1897) , p. 293. Bethiah Allen was born perhaps about 1711. Nahum Mitchel, History of the Early Settlement of Bridgewater in Plymouth County, Massachusetts, , at https://books.google.com/books?id=KIc-AAAAYAAJ . Bridgewater, Massachusetts: Henry T. Pratt, (1897) , p. 93. Vital records of Bridgewater, Massachusetts, to the year 1850, Boston, Massachusetts: New England Historic Genealogical Society, (1916) , Vol 2, p. 26. Vital Records of Weymouth Massachusetts to the year 1850, , at https://archive.org/stream/vitalrecordsofwe02weym . Boston: New England historic genealogical society, at the charge of the Eddy town-record fund, (1910) , Vol. 1, p. 320. Vital Records of Weymouth Massachusetts to the year 1850, , at https://archive.org/stream/vitalrecordsofwe02weym . Boston: New England historic genealogical society, at the charge of the Eddy town-record fund, (1910) , Vol. 1, p. 319.